VASTATOR - Artwork for "Machine Hell" revealed + new song online ! VIOLENTOR (Ita) "Putrid Stench" 12"LP 2019 - PRE-ORDER !!! VIOLENTOR (Ita) "Putrid Stench" CASSETTE 2019 - PRE-ORDER !!! 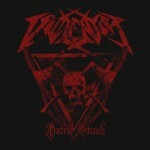 VIOLENTOR (Ita) "Putrid Stench" CD 2019 - PRE-ORDER !! !